Marvel vs. Capcom: Infinite’s reputation has taken a hit in its second week of competition. Blame an inescapable combo some players are hoping gets banned, low attendance at an official Capcom event, and a rules fiasco that affected the finals of an important tournament. Marvel vs. Capcom: Infinite includes two specific systems that the developers implemented to prevent endless combos. Unfortunately for Capcom, fighting game competitors are tenacious when it comes to breaking a game. A video tweeted out earlier this week by a Japanese player named Muto showcased the earliest known footage of a combo that utilizes the slow-moving projectile created by the Reality Stone and Spider-Man’s web ball to trap the opponent in a never-ending torrent of cosmic energy and synthetic silk. Due to the way Spider-Man’s web ball captures a character, it doesn’t trigger the infinite prevention system that kicks in when a set amount of grounded attacks land in a row, and hitstun deterioration also doesn’t factor into the equation. While the scenario in the original video is unlikely to play out in a normal match due to the difficulty of catching the opponent with either of the slow-moving attacks, additional players began to showcase legitimate setups with characters like Haggar, Jedah, Captain Marvel, Ultron, andChun-Li. It quickly became obvious that the Spider-Man infinite could be used in a variety of situations, and the relative ease of pulling it off meant it was available to anyone who learned the timing. The competitive community fell into two camps: those who wanted the infinite banned and those who didn’t. Armando “Angelic” Mejia, a high-level competitor who runs a yearly Marvel vs. Capcom­-centric event in Arizona known as Undefeated, summarized his grievances in a lengthy Twitlonger post. On top of being simple to use and boring to watch, he said, the combo negates Infinite’s important tag system and limits variation in strategies. “I can tell you with full confidence if esports money is on the line, you would be playing Spider-Man,” he wrote, arguing that, unless the move is banned, there’s no reason to pick anyone else. Proponents of letting the infinite stand, however, follow the age-old belief that if a technique is readily available in a game, it should be allowed. Due to the general looseness of its gameplay, the Versus series has a long history of unconventional strategies that seem unfair at first. 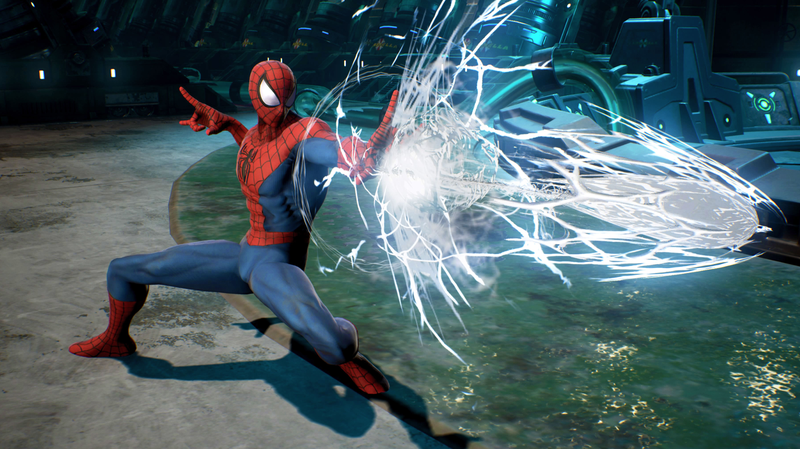 On Twitter, fighting game veteran Alex Valle described banning the Spider-Man infinite as a “slippery slope,” noting that Marvel vs. Capcom’s legacy is rife with these endless combos. They have often been left alone, even as recently as 2011’s Ultimate Marvel vs. Capcom 3, as long as they didn’t completely break the game. Last month, Capcom announced plans for their first official Marvel vs. Capcom: Infinite tournament series. Battle for the Stones gives competitors the ability to earn unique Infinity Stones by winning specific tournaments across the globe, which in turn give players special powers at the main event, like switching opponents or erasing a single loss within a set. The first such tournament, SoCal Regionals, went off without a hitch, but Infinite’s trip to Europe was a disappointment. Held at the Milan Games Week convention, the region’s only Battle for the Stones tournament saw a massive decrease in participants. Where 170 players registered for SoCal Regionals, a scant 13 signed up to compete in Italy, according to details provided by tournament champion Richard Nguyen. And on the day of the tournament, it became clear that Milan Games Week had just enough competitors to run an eight-player bracket, making it the smallest of Capcom’s official tournament since they started providing serious support to the scene in 2012. While the developer’s esports division has been less than helpful in verifying these numbers, Nguyen confirmed that the handful of players included in the online bracket were the only ones to participate. There are a few possible reasons for the sudden downturn. Registration for Milan Games Week’s Battle for the Stones event was opened just a few days before the tournament was scheduled. There was also some confusion in the original announcement, which stated the event would run a single-elimination bracket instead of double-elimination before being corrected. And finally, Marvel vs. Capcom is truly an American game; six of the seven Evo champions for Marvel vs. Capcom 3 hailed from the United States, and before that, global champions were almost unheard of. But even with all that in mind, failing to surpass eight players at such an important event is a huge black mark on the Infinite scene, and rather worrying when held up alongside early reports of poor sales for the game in Japan and the UK. Whenever a new fighting game drops, the early weeks and months are typically a hotbed of discussion concerning the ways in which the new release should be played. Marvel vs. Capcom: Infinite was no different, thanks in part to its introduction of simple control schemes, and players are still trying to settle on a standard ruleset for the young title. Apart from the usual arguments for the merits of best-of-three and best-of-five formats, the competitive scene has yet to decide if Infinite’s auto-combos (simple strings that can be performed by mashing light punch) and easy hyper inputs (which allow players to use supers by pressing heavy punch and heavy kick simultaneously) should be allowed during serious play. While these options are intended to help newcomers learn the ropes, easy hyper inputs in particular have become a potentially essential part of the game due to the way it handles something called super freeze. Super freeze refers to the way the screen freezes during a super attack in fighting games. But where Marvel vs. Capcom players are usually able to activate their own super as a way to counteract their opponent’s during this freeze, Infinite eats these inputs. The only way for a competitor to truly reversal an opponent’s super attack in this way is to use easy inputs, as highlighted in the video below from Evo 2015 champion Nicolas “Kane Blueriver” Gonzalez. While these easy inputs aren’t much simpler than the regular method, the option had a major effect on a match at this weekend’s The Fall Classic in Raleigh, North Carolina. When local competitor Jon Slayton came up against fighting game community veteran Erik “Smooth Viper” Arroyo, he seemed more than capable of taking on the three-time Evo finalist. Their set came to a quick conclusion, with Slayton defeating Arroyo by a score of 2-0, but as soon as the bout wrapped up, multiple spectators pointed out that Slayton had been playing with easy hyper inputs enabled, according to details provided by both Slayton and Arroyo. In the resulting confusion, a judge notified the competitors that the match would need to be replayed despite the rule being absent from The Fall Classic’s official guidelines. The decision to completely restart a match in this way is controversial, but scenarios like this are not new. Without a governing body to enforce a universal ruleset outside official Capcom events, tournament heads are free to craft and interpret their own rules as they see fit. This has the benefit of allowing grassroots organizers to run their events without corporate interference, but can also lead to situations like the one that played out at The Fall Classic, and players are hoping more concrete guidelines for Infinite play are hammered out by the community as soon as possible. These disparate events don’t have much in common, but their effects on Infinite have compounded. Where players were excited about the prospects of learning and competing in a new game, the rapid onslaught of disappointing turnouts and controversies has exacerbated the existing air of mistrust when it comes to Capcom’s fighting game properties, even if the most recent problems aren’t explicitly the developer’s fault. While serious competitors generally agree that Infinite is a competent release worthy of high-level play, these issues have contributed to a growing fatigue that may threaten the game’s future. It remains to be seen if Infinite can rise above the latest tidal wave of negativity washing up on Capcom’s shores. The new game has a lot of making up to do, thanks to an underwhelming Street Fighter V launch that continues to hang over its sibling, and another weekend like the one it just had could break the backs of players already fed up with Capcom’s shortcomings. Fortunately, chaos is Marvel vs. Capcom’s middle name, and its most fervent advocates are nothing if not passionate to see it succeed, even if that success comes in spite of itself.